Which family members lived during World War II? According to my genealogy software, there are 66 people in my current family tree who were alive when Canada declared war on Germany on September 9, 1939, including all four of my grandparents. 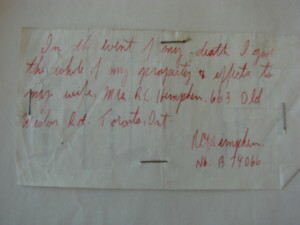 Richard Charles Himphen’s only will was a note about his wifeat the back of his log book. He died in Italy. By the time the last battle in continental Europe ended on May 20, 1945 the number of people alive was up to 70, even though 45,400 Canadians died in the war, including my mother’s father. My mother and father were among the people born during this time. According to demographer David Foot, 2.2 million people were born in Canada during this time, just ahead of the baby boom that began two years later. I never realized how clear demographic trends become while doing genealogy. Previous postWhat does researching our ancestors tell us?